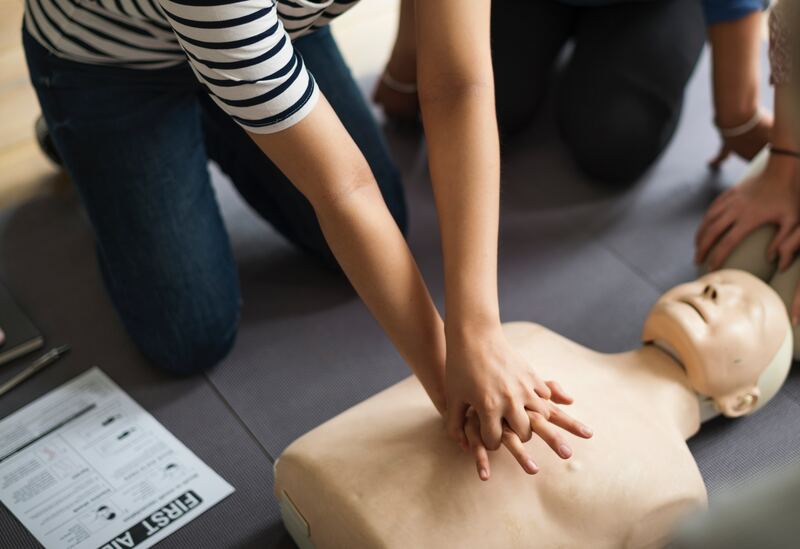 This 2½ hour session is specifically for those who have previously attended one of our HealthFirst Cardio-Pulmonary Resuscitation (CPR) courses. It allows participants to receive a hands-on, practical refresher of important First Aid techniques that could save a baby, child or adult’s life. How to approach a medical emergency in order of priority. How to assess a person’s level of consciousness. Putting an unconscious person into a safe position (the ‘Recovery Position’). How to give CPR to babies, children and adults. What to do for a choking child or adult. Disclaimer: Click here to read our full disclaimer. Thank you for the training. It was very clear, pedagogical and practical. I feel I have learned something not only useful but essential for my future. I spent part of the evening showing and explaining to the family the first actions to take in case of emergency. Dr Michelle is an enthusiastic instructor who made learning a pleasure. The informative information was followed by hands-on application throughout the course. Excellent presentation skills. Je tenais à vous remercier personnellement pour votre intervention. Votre présentation était instructive, utile et efficace. Nous ferons notre possible pour être à la hauteur de cet apprentissage!